For this gardener, January and February are the most boring months of the year. Fortunately, for bored gardeners like myself, The Grumpy Gardener (Oxmoor House, 2017) by Steve Bender will provide clever information with enough humor to add chuckles with every article. Bender or “The Grumpy Gardener” as he likes to be known, has written for 30-plus years for Southern Living magazine. He explains that his third and newest book is “a compilation of Grumpy’s most popular blog posts, accompanied by astute observations, brilliant tips, 157% guaranteed correct answers to common garden questions” and selected articles from Southern Living. 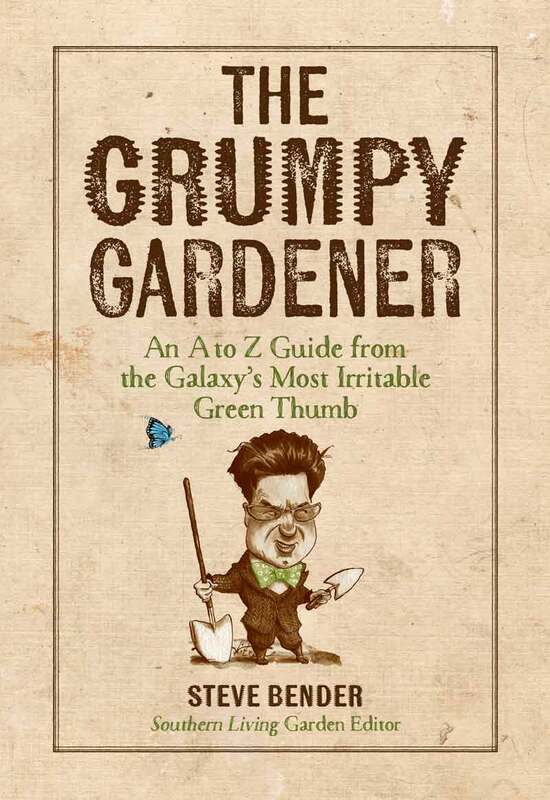 The book’s subtitle, “An A to Z Guide from the Galaxy’s Most Irritable Green Thumb,” describes the alphabetical arrangement of its content and hints at the laughter provoked by his writings. Bender’s use of adjectives to alphabetize information in amusing topics like “awful plants,” “ugly spuds,” “fake Christmas trees,” and “killing your jade plant” makes the book more interesting and the included index helpful. For a gardener who is new to the South, this book is a blessing. Bender discloses the good, the bad, and the ugly of southern gardening by recommending plants to include, avoid or discard. Bender’s suggested good plants will beautifully fill any yard. He mentions the names of old and new varieties that will do well and sources from which unusual plants are available. As an example, Bender recommends panicle hydrangeas as “the easiest hydrangea of all.” This plant is tolerant of “blazing sun, heat, cold and drought.” For me, this type is a definite future purchase to combat the loss of blossoms from Raleigh’s late frost in the last two years. Willows, Bradford pears, verbenas, hybrid tea roses, yellow summer squash and mimosa trees are a few of the bad garden temptations Bender claims are best suited for a hoe or an axe. A new comer to the South might wonder why the many mimosa trees with their gorgeous blossoms are one of Bender’s top candidates for chainsaw use. He wisely explains that each beautiful blossom matures into an unattractive large brown seedpod, which results in numerous mimosa plants to be ultimately uprooted. In addition to comments on specific plants, Bender expresses clever opinions on equipment, mulches, fertilizer, lawns, and other aspects of home gardening. All his articles are based on facts and seasoned with humor. If boredom persists after you finish the book, get other regular doses of garden information and laughter from Bender’s colorful blog at southernliving.com/garden/grumpy-gardener. Listen to our podcast interview with The Grumpy Gardener on our website at TriangleGardener.com.